Has Ireland backed down from their shameful decision to hold a Zionistfrei Holocaust event? As the blog Israellycool and others have recently reported, the trustees of Holocaust Educational Trust Ireland(HETI) have forbidden the master of ceremonies at the annual Holocaust Memorial Day ceremony on January 25th, 2015, from mentioning the word “Israel” or the phrase “the Jewish State”. 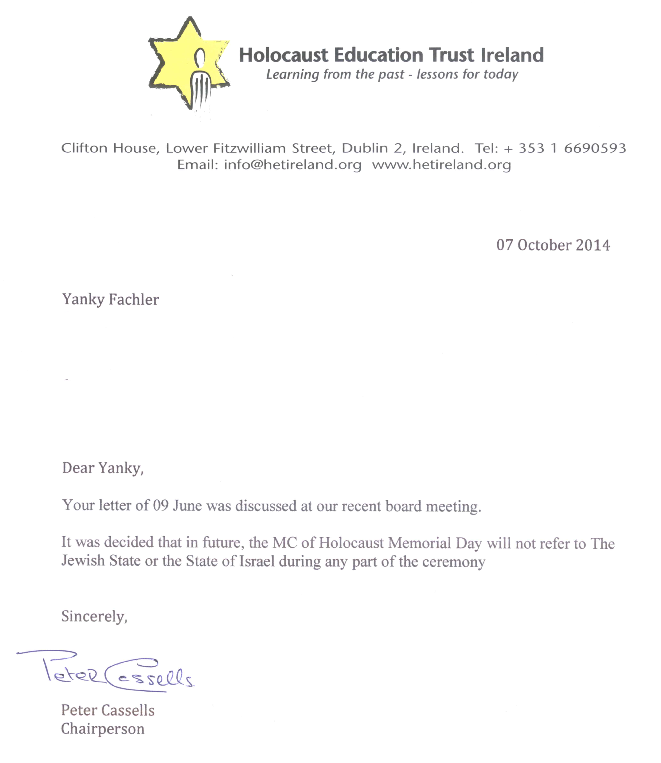 Here’s the letter sent to Yanky Fachler, the former master of ceremonies, from HETI chair Peter Cassells explaining that no mention of the Jewish state will be permitted by the MC at the event at Dublin’s Mansion House. Six days later, Fachler received another letter from Cassells telling him he was being replaced after 12 years on the job. Four days before the 2014 HMD event, Fachler had similarly been banned from mentioning ‘Israel’ but had still participated in the event because he did not want to be responsible for a last-minute problem by pulling out. However, he then wrote to HETI suggesting that their stance could be interpreted as caring more about dead Jews than living ones – a letter which likely was the principal reason why he was dismissed. However, it still doesn’t appear as if they’ve retracted the original letter to Fachler, and it is unclear if the new MC (whose name is yet to be announced) will be permitted to mention Israel. 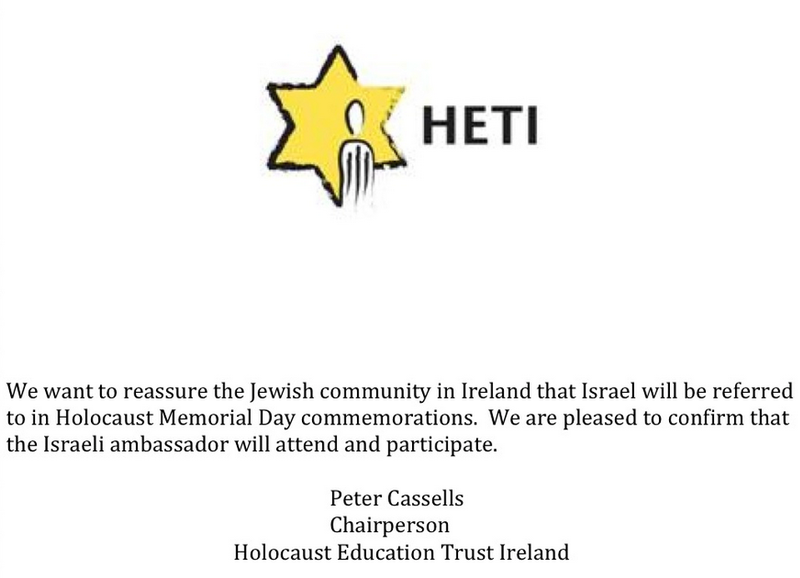 The Israel Ambassador to Ireland still says he will attend the HMD event next month, though how he can attend while the status of the HETI ban on the MC mentioning ‘Israel’ is still unclear remains a mystery. HETI’s disgraceful policy is yet another example of attempts in Europe to sever the link between Jews and the State of Israel, seen for example when the trustees of the Tricycle Theater said they would not show films at the Jewish Film Festival that were partly financed by public money from Israel. HETI must surely do the same, and we believe that the Chair of the Trustees Peter Cassells should resign. We’ll keep you posted if any new information becomes available. As an Irishman I have followed this sorry saga with a mixture of disbelief, shame and seriously growing fear about where we are going. The original letter is really only a few keyboard strokes away from calling Israel ‘the Zionist Entity’ – and these are the people entrusted with the precious task (precious not just for Jews, but for Ireland and indeed for everything that ideas of freedom, truth, democracy, justice, hope, progress should mean in our civilisation) of teaching the truth about the Holocaust, in particular to children. I am sorry to say that the majority of my fellow-countrymen would probably see nothing wrong with ‘banning’ Jews from mentioning Israel… Banning ‘words’ is currently a major part of the assault on all our freedoms – in search of a language (Newspeak) in which only ‘acceptable’ opinions can be expressed. They want to persuade us the very word Israel is a ‘thoughtcrime’. That’s very worrying begrudger, yet not isolated to Ireland or even stops with Israel. Sadly it appears that Ireland’s representatives seem to forget what it means to be laughed at, mocked at and called an illegitimate nation. “No blacks, no dogs and no Irish” signs has just but changed the name. This is sad, but I’m glad to hear that never again still rings true in some circles as it should. And that goes for all racism. Not isolated to Ireland, but I note with disgust the level of antisemitism in Ireland (and Scotland). Sinn Fein are deeply antisemitic, of course. Yes Leah. It’s amazing how different they are since the 70’s then how they used to be in the 40’s with regards to their support to the Jewish struggle of self recognition. The Irish fighters for independence have long been a good supporters of the Zionist movement. This has changed badly since the late 70’s and early 80’s. Coinciding with the rise of the right wing in Israel perhaps? Banning and boycotting, if need be physically. That is a new reality. Where political violence verbally and actual thuggery in public is becoming acceptable. But as long as I do this for “x” I can punch you in the face or call you something obscene. Those who have had exposure to Left wing violence in the past may recognize certain tactics which seem to be gaining an acceptance in everyday life. Bleeding out of the NGO scene, blending into the press. There is a strategy here I think. Part of the ongoing attempt by the practitioners of a religion that celebrates the Jew Jesus to write Jews out of history. I’m not sure I understood all of this. It looks like the original letter from Cassells to Fachler was a response to some earlier letter Fachler himself sent (“Your letter of 09 June was discussed”). What’s the motivation for not mentioning Israel? What a bizarre story. Nice people over there, firstly calling for a recognition of another Sharia state, then an Irish takeover of the Holocaust memory. It looks like the antiIsrael people are in Irish overdrive. Like the Sheen and Blumenthal Bundestag meltdown this will only serve Israel’s purpose. As these missteps happen more and more often the wider audience will see the true face of these antiZionist clowns. It is like Hamas and all Islamists. Eventually the mask slip. The suit wearing Islamofascists. I think it is a great idea that we no longer talk about Jews. Let us live a life without Jews. We will not murder them. We will simply cease to talk about them. Like our Islamist friends we will dehumanize the Jewish phenomena and refer to them only as an “entity”. I am sure I heard of this before in history, not too long ago. One of the pre-Shoa requisits was the removal of all Jewish things. From park benches, from trams and buses. From surgeries and law offices. From butchers and class rooms and the Post Office. You stop talking about them, and then one day they are all gone. The last anyone saw of them was on the way to the train station. There is something chillingly Kafkaesque about the Irish Holocaust Educational Trust instructing a Jewish MC at a Holocaust Memorial Day commemoration not to mention Israel or ‘the Jewish state’ even if they have now rescinded their decision. Presumably there will be minutes of the HETI meetings where this was discussed and perhaps the public will be able to have access to them, although given the long history of Church-imposed censorship in the Republic until fairly recently I have a feeling old habits will die hard. (To give one example, the works of James Joyce were banned for many years). The fact that the Irish President, Eamon De Valera, called in at the German Embassy in Dublin just before VE Day to sign the condolence book for the death of Hitler speaks volumes about the Republic’s attitude to nazism. For years the narratives of the Israel-haters regardless of whether of the Left or Right has been that Israel exists only because of the Holocaust or because of an ‘invented’ Holocaust. In this latest bizarre permutation in Dublin, the Holocaust happened but Israel has no connection with it. Perhaps it was an attempt not to offend the Republic’s Palestinian ‘friends’. I can see the point there. All too often the State of Israel acts as if it represents all Jews worldwide, when it does not. It would be like Italy declaring that everything Catholic must be related to Italy in some way. The above letter is a reaction (perhaps an overreaction) to the continued attempts of Israeli politicians to paint themselves as the leaders of Judaism. Holocaust Memorial Day is intended to remember the millions of Jews (along with Roma, gays, Jehovah’s Witnesses etc) who were murdered by the Nazi regime, not those who sailed to Jerusalem to carve out a new country. Considering how many Survivors live in Israel it is silly to void that. this is NOT about IL=ALL JEWS. This is about antisemitism in Leftist culture. And to sign off words which may or may not be said at an event like this is just stupid. If you fail to see this then you need to go back to school. Well, I take offense to that remark. Sailed to Jerusalem to carve up a new country… As if. I agree about the other minorities you mention but wiping away the reasons why so many Jews fled Europe to the “safety” of British manadated Palestine, risking hard labour, harsh desert conditions, raids by Arab thieves, malaria and the complete removal of all the modern comforts they had in europe, is looking the other way about the reasons of the Holocaust! You sir are doing whet most of Europe did during the 30’s. You look the other way. This is nothing to do with Judaism and everything to do with Israel. Am Yisrael! The people of Israel. If you can’t see that there’s little point to explain. another point on my mind. Israeli politicians tend to paint themselves that way because when the s hits the f there is only one place for Jews to go to. Although these politicians are not Jewish leaders they do represent the place where Hebrews can go. As the French are doing by the thousands. Your Italy/Israel is off and wrong. You need to understand what you write, and you plainly do not. It is tragic that non Hebrews always tell the Jews what is ‘really’ going on. Quite typical for an antisemite this comment concerning the survivors of the Holocaust. I’ve scanned all the comments and no one has written anything like that. It’s not as if the ceremonial speech would be highlighting Israel every other word, is it? In any case: Jerusalem’s policies should have no bearing on how a Holocaust memorial speech in Ireland is to be worded. Apologists like you need some schooling – but preferably not from the Educational Trust in question. I can see how this ‘major’ issue continues to haunt the human rights warrior so let’s put your mind at ease. Most Jews in the world support the continued existence of a strong Israel. As for Ireland, since the majority of people of Irish descent don’t live there is it appropriate for the republic to keep using that name? Now there’s an issue to sink your teeth into. It’s not as if they represent everyone who is Irish, do they? A bit of false advertising to say the least, no? I see that you have decided to blindly apply your overtly moronic generalizations regarding Jews, Israel, and Zionists. Which isn’t surprising seeing as how you simply posted 3 paragraphs of utter drivel declaring your world view of Yids. 1. The Catholic analogy is bonkers. The Jews are a nation. Israel is their homeland. 2. “those who sailed to Jerusalem to carve out a new country” – just the usual unhinged nonsense about Israel being invented after 1945. How so? How does so ‘acting’ actually look? What is it about any Israeli action that evinces the adverb ‘as-if-representing-all-Jews-worldwide-ly’? Isn’t it more a case of such as you +inferring+ the above, rather than anything’s Israel actually does +implying+ it? In which case, isn’t it time you started looking within yourself for the prejudices and a priori assumptions you consciously +choose+ to so project? Or perhaps, more accurately, as if imperial Roman, pagan and Christian, had been the one to originally dispossess Jews and keep and sanctify that dispossession, as Jews proper punishment for rejecting Jesus and the prophets, establishing provincial Palestine in their place, with the result that, even in the 19th and 20th centuries, most European, North African and Asian Jews were regarded as less nationally European or, say, Arab, than as nationally Judaean, that is to say, ‘Palestinian’, with a further consequence’s being their being driven out, either to the next world, or, before 1914, mostly to America, after 1914, mostly to Palestine or what became Israel. Your Italian Catholic analogy falls totally flat, since it was Italian Roman Catholic Christianity that did most to establish the Jews as a nation exiled and dispossessed for rejecting Jesus and the prophets, in which state of stateless they were to remain, or be maintained; which meme Islam in no small part imbibed and inherited, as the paradigm of Abrahamic succession. You’ve managed to put your finger on the one entity that was most responsible for creating the whole problem in the first place! The Exiler creates the Exile, the Premise of the Return, and which is the State of Israel. If the Holocaust is the Nadir of 2000 years of Jewish stateless and dispossession, the imperial Roman pagan and Christian establishment of provincial Palestine in Jews’s place is the beginning! The first Palestinian Christian extant is a Greco-Roman colonial who openly declares God has chosen the Greco-Romans to conquer and dispossess the Jews as the Israelites did the Canaanites. Looks like some of the Trustees of the “Education” Trust need some more education. Truly disheartening and disrespectful. The letter’s brief to say the least – but has any kind of explanation for that preposterous decision been provided? Rescinded or not, the malice was exposed. Israel and all decent Jews should tell the HETI where to go. Let Peter Cassells build a beautiful world of Holocaust commemoration without any Jews, just the way Europe has always wanted it. This is what Europe’s problem with Israel has always been about; Jewish empowerment. It sticks in the throats of European chauvinists who think it’s their birthright to decide on the fate of its Jews, and then cry their crocodile tears over how they barbarically and methodically murdered them. The Cassells of this world want Jews to return to the dark days before the Holocaust, where they were at the mercy of Europe’s fashionable pathologies. The least the Israeli ambassador to Ireland can do is give Cassell and the Irish Catholic establishment that nurtures him, the diplomatic finger and ask the pertinent question, what the hell is he doing leading HETI in the first place? ask the pertinent question, what the hell is [Cassell] doing leading HETI in the first place? HETI has NOT rescinded the decision. The MC of the 2015 HMD is banned from mentioning the word ‘Israel’ or the phrase ‘the Jewish State’. And the same for all future HMDs. Just out of curiosity, can they mention Zion, or Tsion? If the MC is forbidden by HETI from mentioning Israel at all future HMD commemorations, then who will be allowed to mention Israel? I ask this because the later HETI letter reproduced by Adam above clearly states that HETI assures the Jewish community of Ireland that Israel will be mentioned. HETI may not have rescinded the original letter — I didn’t say they had — but my reading of Adam’s information in the link above is that they appear to have rescinded the decision not to allow any mention of Israel. It’s possible they merely mean the Israeli Ambassador will be allowed to mention which country he is Ambassador of. This is an important matter and it would be very useful if you could explain the situation a little more clearly as I for one am currently limited to the information provided above. This is why I am hoping the Minutes of the HETI meetings where this was discussed will be made publicly accessible (although as I have said, I am not hopeful)..
As it stands it seems that anyone but the MC can mention Israel. Absurd I know. But remember that the Ambassador was not even invited to speak until 3 years ago. Even now he is expected to read something that is given to him, he cannot say what he wants. 4 years ago a second generation descendant of a Holocaust victim was invited on stage to light a candle and as a silent protest against the exclusion of the Ambassador, she undid her jacket to reveal a shirt with an Israeli flag on it. It is a shameful disgrace. If Israel had existed ten years earlier, millions of Jewish lives lost in the Shoah might have been saved. Israel performed a vital role in taking in Holocaust survivors and providing them with a home. There are more survivors in Israel than in any other country. Israel is the best possible guarantee for the Jewish people of ‘Never Again’. The Israeli Ambassador should play a prominent role in the HMD event – not be there under sufferance. Thank you, Jonathan Hoffman. I was previously unaware of what you say here about HETI, but had your previous post explained these points I wouldn’t have needed to ask for further clarification. Anyway, many thanks for taking the trouble to explain my queries and enlarge on matters. As you rightly say, an absurd situation if the MC is never going to be permitted to mention Israel, but Israel is going to be mentioned in some as yet unexplained and ‘controlled’ way. As to the trustees of HETI not having any Minutes of their meetings, surely that is unusual for a trust such as this, but I suppose it covers their tracks. There never was such a decision. See the letter – the MC is forbidden from mentioning Israel. And there are no minutes of HETI trustee meetings. The ambassador should protest by not turning up. I wonder how they would introduce the Israeli Ambassador without mentioning the word “Israel”? It might be like that scene at the end of Galaxy Quest” (spoiler alert) when the crew stumble out of the crashed ship onto the stage of a GQ convention, where the MC introduces them one by one by character name AND the name of the actor. Perhaps that is what will happen. What would happen if the MC just ignored HETI’s demand and mentioned Israel in his speech? What could they do to him? Stone him on stage? Call in the police? Begin booing? The MC should follow his conscience and not HETI’s dictates. Yanky Fachler complied with the demand last year and got fired for his pains. So the new MC should just go ahead and mention Israel loud and clear. He’s bound to get fired anyway, if HETI’s previous form is anything to go by. I quite agree with HETI that Holocaust memorials ought to be about ALL victims of the Holocaust, but don’t they see the slight irony in marginalising the Jewish State – when their very logo – predominantly a yellow Star of David – acknowledges the centrality of the Jews in the story of the Holocaust? bugga it, and just mention Israel . You gonna get fired after event anyway . Its a bloody ridiculous imposition . Don’t be a monkey dancing to the anti semites . You dont get any extra peanuts for it . Peter Cassells was not the instigator of this policy. It seems it was Lynn Jackson, who is Jewish but hates Israel. oh good stuff then. he didn’t instigate he just signed on the dotted line . No we are not missing the point. The point was to silence the mention of Israel . We just saying why collude with it if you know its wrong ? “Lynn Jackson, who is Jewish but hates Israel” – there should be a name for this mental illness. What does she for a living? “According to the Israeli embassy in Dublin, until three years ago it was HETI policy not to invite the ambassador to the Holocaust Memorial Day ceremony, a policy changed following Israeli lobbying. “This year the ambassador will be reading a text provided by the organizers of the event. Although the Israeli dimension and the conditions of the embassy’s participation in this event are less than what we would ideally desire, we consider it preferable to participate in the event than not to do so,” embassy information officer Dermot Meleady told the Post. “The embassy of Israel in Ireland has requested that the text to be read by the ambassador at the Holocaust Memorial Day ceremony in Dublin will include reference to the indelible connection between Judaism, the Jewish people and the State of Israel as the refuge of the Jewish survivors of the Holocaust. As Jonathan says, the Israel Ambassador is told what to say by HETI. So if he is told to say ‘ I love Michael Jackson ‘ and then do the moon walk, he does it ? The Ambassador of Israel has always been invited and participated in the ceremony. In those years in which he did not give a reading he “only!!!) lit one of the candles to the six million.